The M-litter born at the 7th of March!!. We started the new year by going on a trip to France to have our MultiCH Jazetta mated. This time we think we have really found a true hidden treasure! A wonderful male with a beautiful character and the intelligent and gentle look in his eyes that we cherish so much - and with a head shape just as our Jazetta. The inbreeding index is 0 with this combination. Is a young male (just short of 3 years) that has been shown very rarely and only sired 2 litters so far. His off spring are still young (5 months and 1 year respectively). But we really like the 3 youngsters that we have seen so far! He has a remarkable pedigree. Including descending in direct line from a very strong sire-line of top-producers and top-show dogs! And then he is something as rarely seen as a medium sized male (35,5 cm) full of masculinity and body substance! The father to our up coming litter is: Ma´s Tu Vu De Magistris!!! M´as Tu Vu is sired by MULTICH Issue Fatale De Magistris. 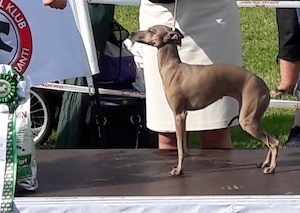 Some of his remarkable wins include Best in Show at Donaueschingen and the World Winner title at the WDS in Milano in 2015 under Breed specialist Mrs. Bitte Ahrens of Sobers Fame. Besides having had a remarkable show career, Issue has sired some very interesting off spring. Issue is after Top Producing MultiCH Genie En Herbe De Magistris. Himself a succesful show dog, but his greatest contribution has been consistently siring quality off spring. Genie is the son of MultiCH viceWW Caprice du Domaine Des Chanteloup. One of our all time favourite males! Sired by one of the recent years absolut Top producers: MultiCH Sobers Galante! Only very few and extraordinary males achieves to have such a huge influence on the breed as Galante has had. This was a presentation of the direct sire-line. Ma´s Tu Vu´s mother is the black Je Pense Donc Je Suis De Magistris. Very nice movements, beautiful curves and the elegant type that we are breeding for. Je Pense Donc is the daughter of MULTICH Grand Cru Classé Bamani De Magistris. He is Vice World Winner from 2015 in Milano. He is one of our personal favourites during the recent years and in our opinion he could just as well have won the World Winner title that year! But on the day he had to settle with the reserve-placement and “lost” the title to his own kennel-mate: Issue Fatale De Magistris (the sire of Ma´s Tu Vu)! A remarkable achievement for the De Magistris Kennel in the breeds home country, with a record entry AND under the highly respected judge, Mrs. Bitte Ahrens! It will be Jazetta´s first litter and we look so much forward to see how she will pass on her qualities to her children. Jazetta is medium size (35,5 cm) and the daughter of MULTICH Italo Dei Raggi Di Luna and our own MULTICH Gemma. 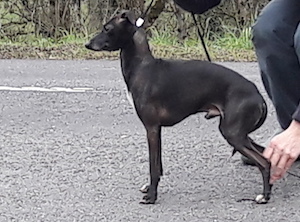 Italo, himself a group winner on international level, is litter brother to Immacolata Dei Raggi Di Luna who became World Winner –18 in Amsterdam. Italo is after WW12 MultiCH Hotfarfale of Devils Pigeons and WW11 MultiCH Serenata Rap Dei Raggi Di Luna. Jazettas mother is our own MULTICH Gemma - a group winner on international level and twice breed winner of the year and twice no. 2 after her litter brother Genghis Khan. Gemma have had 2 litters. From her first litter we kept MULTICH Ietano. World junior winner-14 and European junior winner –14. From her last litter we kept Jazetta. Gemma is sired by MULTICH Nubiad´Versace. Despite only used very limited in breeding he has sired some of the recent years top winners in the breed. F.i. at the World Dog Show17 he was the sire of both World Winners! Gemma is after our MultiCh Fiona (litter sister to our MultiCH Felicia. 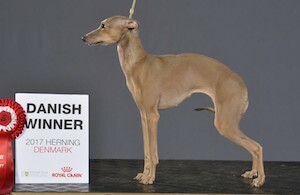 Junior European Winner, group winner on international level and 4 years in a row breed winner of the year). 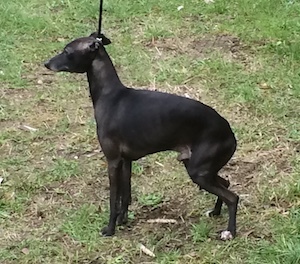 Jazetta is the result of more than 30 years carefully breeding at "Il Cagnolino" and dating back to the very first Italian Greyhound we got back in the 80´ies. 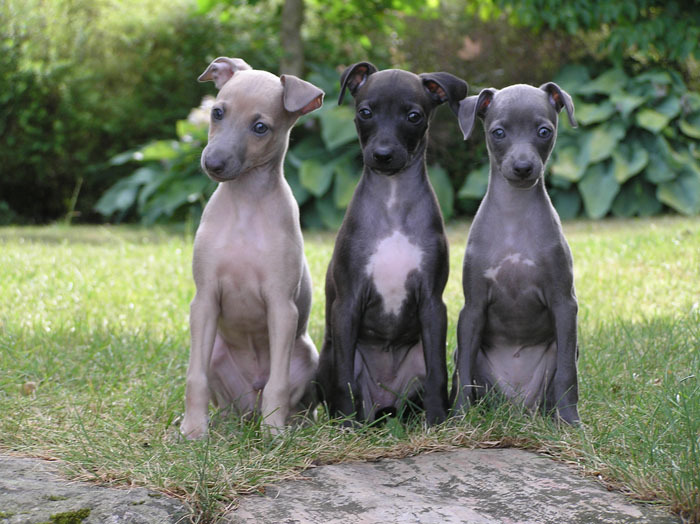 Don´t hesite to contact us if you are interested in our next litter!